CHAPEL HILL, N.C. (AP) — A scandal involving bogus classes and inflated grades at the University of North Carolina was bigger than previously reported, encompassing about 1,500 athletes who got easy A's and B's over a span of nearly two decades, according to an investigation released Wednesday. Most of the athletes were football players or members of the school's cherished basketball program, which won three of its five national titles during the scandal (1993, 2005, 2009). Athletic director Bubba Cunningham wouldn't speculate on any possible sanctions. "We'll work with the NCAA and work through the report with them as part of our ongoing investigation," Cunningham said. "That's going to take some time." In all, about 3,100 students enrolled in classes they didn't have to show up for in what was deemed a "shadow curriculum" within the former African and Afro-American Studies (AFAM) department from 1993 to 2011, the report by former U.S. Justice Department official Kenneth Wainstein found. Many at the university hoped Wainstein's eight-month investigation would bring some closure. Instead, it found more academic fraud than previous investigations by the NCAA and the school. The UNC case stands out among academic scandals at Harvard, Duke and the Naval Academy, said Howard Gardner, a professor at Harvard's Graduate School of Education who studies cheating. The scandal reached back to the final years of legendary men's basketball coach Dean Smith's tenure, as well as Mack Brown's time as football coach before leaving for Texas and John Swofford's stint as athletic director before becoming Atlantic Coast Conference commissioner. 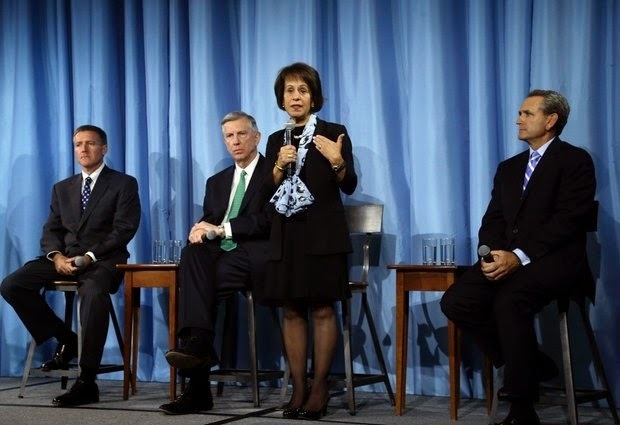 Chancellor Carol Folt wouldn't identify the terminated employees or those facing disciplinary review. "I think it's very clear that this is an academic, an athletic and a university problem," Folt said. Wainstein said he found no reason not to believe them. Faculty and administration officials missed or looked past red flags, such as unusually high numbers of independent study course enrollments in the department, the report said. "By the mid-2000s, these classes had become a primary — if not the primary — way that struggling athletes kept themselves from having eligibility problems," the report said. Unlike previous inquiries by former Gov. Jim Martin and the school, Wainstein had the cooperation of former department chairman Julius Nyang'oro and retired office administrator Deborah Crowder — the two people at the center of the scandal. Nyang'oro was indicted in December on a felony fraud charge, though it was dropped after he agreed to cooperate with Wainstein's probe. Crowder was never charged. It was Crowder who started the paper classes to help struggling students with "watered-down requirements" not long after Nyang'oro became chairman in 1992, according to the report. Though not a faculty member, she registered students for the courses, assigned topics and handed out high grades regardless of the work and also signed Nyang'oro's name to grade rolls. By 1999, in an apparent effort to work around the number of independent studies students could take, Crowder began offering lecture classes that didn't meet. After her retirement in 2009, Nyang'oro met requests from football counselors to continue the sham classes and graded papers "with an eye to boosting" a student's grade-point average, according to the report. He stepped down in 2011 as questions were raised. Associated Press writer Emery Dalesio contributed to this report.